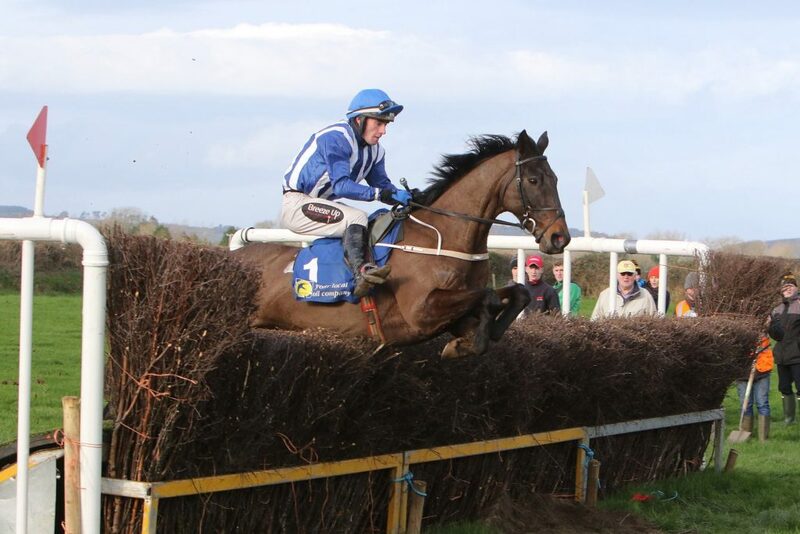 Call His Bluff and Michael Sweeney clear the final fence in the Al Eile Stud Sponsored 5yo+ Confined Maiden(Nov rdrs) at the annual Dungarvan Farmers Point to Point at Kilossera, Dungarvan on Sunday: Photo: Dan McGrath. Fairyhouse – The progressive Honeysuckle was a 6/4 winner for Henry De Bromhead. Scarteen Point – As a jockey Declan Queally registered a treble courtesy of Solo Cargo, Fennos Storm and Springfield Fox and for good measure also trained the latter two winners. Michael Veale of the Old Fools Partnership was successful with Carrigmorna Pine. Dungarvan Point – Melleray neighbours owner/trainer Niall Hennessey and jockey Mikey Sweeney combined to score with Call His Bluff. Ballyduff Upper owner Michael Fennessey was on the mark with Holly Flight. Naas – The Henry De Bromhead trained Poker Party scored at odds of 8/1. Henry De Bromhead trains Falco De Candale who finished runner up in a Cork bumper. After his name the horse carries the suffix Aa. This means the animal is Anglo Arabian a separate breed to thoroughbreds which is the result of various crosses between thoroughbreds, Arabian and Anglo Arabian horses. Sean O’Keeffe is sidelined with a damaged collarbone sustained in a heavy fall at Naas. The death occurred last week of former trainer Jimmy Feane. Jimmy also worked as head groom for Moyglare stud farm for a long number of years. Well known Scottish born sportswriter Hugh Mcilvenny also died aged 84. Former English flat jockey Alan Proud died aged 61. Jockey Aubrey McMahon lost his appeal over the five days ban imposed by the Tramore stewards over his ride on Batcio on New Year’s Day. The BHA intention in implementing a rule that horses competing in National Hunt races in the UK must wear a full complement of shoes has been deferred for six months. With his main owner cutting back on his involvement in British racing trainer George Peckham is set to hand in his licence. Executive Capilano failed to return home from Warwick while Casse Tete was a Cheltenham casualty.